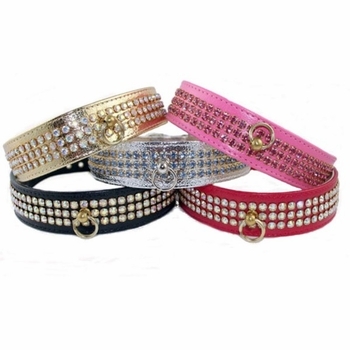 Our beautiful rhinestone dog collar has 3 stunning rows of sparkling rhinestones. This dog collar is 1 inch wide and made of good quality vinyl. This collar is available in Red with iridescent rhinestones, Black with iridescent rhinestones, Gold with iridescent rhinestones, Pink with pink rhinestones, and Silver with light blue rhinestones. These collars tend to run a little small, please take note of the below size chart. Size 16 will fit a dog with a 11-1/2 to 13-1/2 inch neck. $26.99.